like when Day told Knight they couldn't go around messing with the cars of every Russian they meet...ok, if you say so Day but personally I'm cool with it, especially when it seems like every Russian you meet is trying to kill you. I say go for it. and then we have Knight. I'm still not sure that I can say I like him but I was happy to see a bit of growth with him and I liked the whole side story of him and the kid that he caught robbing his garage...it was sweet, but not overly and that's all I'm saying on that subject. Well that and the fact that this was a nice little side step from everything else that was happening and I liked getting to see Knight interact with someone other than Day or the 'bad guys'. While he still maintained his gruff demeanor, we also got to see a kinder more caring Knight than I had believed was there...I have hope! As for Knight and Day's relationship well there was a bit of growth there as well. While Knight's still got a long way to go at least this time around we got to see a bit of introspection on his part...although the visit from the dead wife was something I so could have done without...but maybe that's just me. Day has thankfully stood up for himself form the word go with Knight and I like that this continued in spite of the fact that he's willing to take care of Knight when he's needed, it didn't mean that he wouldn't stand up for himself whenever Knight decided to be a jerk! Day would call him on his douchy behavior, something that Knight desperately needed. But on the other side of this coin I have to admit that I found it hard to buy the attraction between these two because of how often they were at odds with each other...maybe, if this aspect of things could shift a bit so that the conflict between these two eases up a bit I'll find them to be more believable as a couple and maybe that's just me and I'm cool with that too. We all have our own personal preferences as to what does or doesn't work in a relationship and I can honestly think of more than one couple that have had pretty high levels of antagonism going on between them and still as a couple it's worked for me. This is such a subjective aspect and while Knight and Day aren't quite there for me as a couple at least this time around I started to feel like I could see the possibility. Once again I was treated to the opportunity to enjoy the narrations of Andrew McFerrin and he did not disappoint in any way especially since having the same narrator in the second story as there was in the first one made it that much easier to become invested in the story. Even more important than whether or not a narrator sounds how I think a character should sound is having the consistency of that character sounding the same from story to story. Something that adds believability and realism to the story for me as a listener. So far there's one more book listed for this series, 'Dawn and Dusk' and I have to admit while I doubt I'll read the e-book if it gets released on audio and Andrew McFerrin's the narrator I may just give it a try. 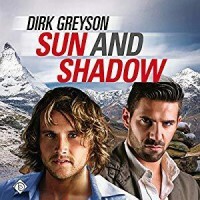 An audio book of 'Sun and Shadow' was graciously provided by the publisher in exchange for an honest review.